Another MonsterArts, another Alien. This is one of my three favorite designs from the franchise, so I am going to be judging this with a pretty harsh eye. Right off the bat, it looks like a guy in a suit (granted that was what it was), and this figure manages to capture that. Bolaji Badejo was a inhumanly thin man for his height of 7 foot 2 inches, and the "Big Chap" suit was built around him with that in mind. From the long torso to the thin arms and legs, it is just creepy. The lovely Bio-mechanical detail is all there, from the bone-like ribs to the pipes spewing out the back, all in a black plastic with a silver brushing over the entire sculpt. They really went out of their way to make sure this looked like the suit, with one exception (but we'll get to that). I dig all the little lines and holes, to the tubing making up the stomach area and inside the arms. This thing looks fantastic. And just like the AvP Alien, we have a diecast tail tip. This one doesn't weigh it down like the other did, but this tail is overall much smaller. His articulation is likely better than the original suit. it has a 90 degree upward motion, and can be rotated for full over-the-head arm movement. The elbows are your standard double joint found in a lot of Figuarts, and the skinny Alien arms don't hinder that. It utilizes a simple wrist ball for the hand and wrist movement. The head has some forward and backward movement, and some side to side, but it is barely there. Due to the neck and head design, I can see how this happened, sadly. The Torso articulation is just so lovely. It's made up of three separate chunks: the head/shoulders, the ribcage and the stomach, plus the hip area. It allows for a huge range of motion going forward, and less so going backwards. It allows for the area above the ribcage to be moved all on its own, helping rectify the limited neck. The hips and knee -- as you can see -- give off a solid but not fantastic range. The ankles have good range, both side-to-side and front-to-back. The mid-foot joint is not totally useless here for once! Yay! The back tubes are all on balljoints, while the back spine is connected to the upper torso and can move with it while filling in the gap it would leave behind. Pretty great design, honestly. We return to the opening jaw and second mouth, this time with a better design. The mini-mouth is up in the head more, and requires you to tilt the head forwards and shake it down a bit for it to come out. Much better than the previous Alien that simply had it fall out when the mouth was open. The bone color of the mini-mouth is something I am not sure is accurate to the movie, but the teeth are the proper silver. Its tail is made up of many segments connected by balljoints. That being said, this one is thinner and is less articulated than you would think. It's not a bad thing, as the smaller tail provides a better balance. A stand, with acid blood splatter and some more aggressive hands. That's all it gets, this time. "How much more aggressive?" you ask? Well...slightly more. Here's the normal hand compared to the aggressive one. It's more noticeable on the creature than just eyeing them. Something about its slightly curved fingers that makes you think it is reaching out to bore a hole through your skull and skulk off into the shadows. Action poses with it are a bit more limited than you would think. Part of it, at least in my opinion, is the fact it looks like a guy in a suit. The other big part is the VERY visible skull. More on that later. The stand does help with a leaping pose, so that's cool. And he can do the classic "walking menacingly towards you" thing a lot of 80's horror monsters did. My favorite thing is he can do the crouch. I love when an Alien toy can do a good crouch pose. It's tall, but not as tall as it should be. This should TOWER over a Kamen Rider, not be a bit taller than him. With the right angles, it can come up behind one, but, honestly, from a strait on POV, it is too damn small. Kind of a bummer. Remember how I said the last Alien was too short? Well...this guy is actually shorter. What the hell, man? Also, if anyone continues to tell me they can't see the differences between Alien designs, I will smack you. Look at those two - they barely look like the same creature! Ok, lets talk about the thing that bothers me most about this figure: the dome. What happened here? The promo pictures show us a good dark dome, and instead we get one that is very nearly clear. AND misaligned on the toy. LOOK AT THAT. That's pretty damn unacceptable to me. That giant gap shouldn't be there, but thanks to the semi-soft, almost vinyl material the dome is made of, it doesn't sit right. I get that they wanted to make this toy like the costume, and have a hint of a skull under the dome, but this is pretty damn bad. I've actually popped mine off to try and reset it, but it doesn't help. Under the dome, we see just how clear it is. Ugh, this really could have been better. At least the underside is painted and sculpted well. The dome in the movie is a very cloudy, mysterious thing. You see it for the first time and wonder what really is under there. Sometimes you catch a hint of a skull, other times nothing. The suit and prop on set did sometimes have a clear dome, so I can see where they might have gotten the idea. And if the pictures on the box had a clear dome it would at least be more acceptable. But they don't, they have a dome that makes it so you can barely see what is there, good and proper. But look at that dome up there, it is literally nearly 100% clear. That, combined with it fitting very oddly, makes this a huge, gigantic miss. I think this figure is fun, and is sculpted well, with great engineering and build quality. 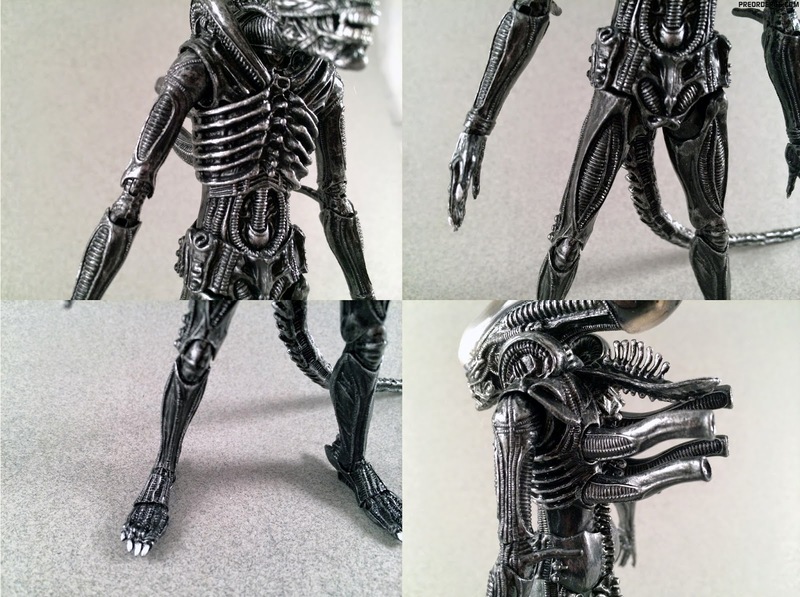 It would easily be my favorite Alien figure based on this design, but that clear dome kills it for me. If the dome doesn't bother you, grab one right over here. For the price, it's still a solid toy, but for me the dome kills the deal. I'm also a huge Alien fanboy, so keep that in mind. if anything, your pics make it looks better. the clear dome looks worse in hand. thanks for the review, i was really looking forward to this until i saw it and this just reinforced that decision. Hey though, I'm pretty sure I'll end up loving it somehow. Great review. I haven't seen many for this guy so this was great to see! Dome bothers me too much. Sorry Bandai, pass. Maybe if they hit super cheap on mandarake or amazon clearance and I don't feel bad popping of the dome and just painting it straight black. Solid black still isn't accurate but would be far better than straight up clear. This is one of those prop vs film things. I'd rather things look like they do on film than be prop replicas.